Anyone with even a passing interest in Maori history will have recognised the ability of Maori to select sites in the landscape that afforded them both a defensive and strategic advantage over any advancing enemy tribes. Often sites were at the top of cliffs, with sweeping views over plains and down river valleys, frequently bordered on at least one side by a river, which acted as a natural moat. Within the Manawatu, for example, the Rangitane pa sites Otangaki (Ashhurst) and Te Motu o Poutoa (Anzac Park) were examples of sites that took advantage of such geographical features.When Europeans first arrived in New Zealand, they were not so cognizant of the natural environment here, and often relied on tradition rather than a close reading of the landscape in constructing their homes and buildings. For example, the insistence on building colonial homes with windows and living spaces facing the south, rather than the north, demonstrated a stubborn incapacity to take simple factors such as sun position into account, and resulted in cold and gloomy homes. However, sometimes pioneering settlers did read (and utilise) the landscape reasonably well, particularly when it was matter of life and death. The Cameron Blockhouse, 6 kilometres south of Wanganui at Marangai, is one such example. The blockhouse is a rare example of a timber blockhouse dating to the time of the New Zealand Wars. It was constructed by John Cameron, who arrived in New Zealand at the end of 1840 and took up land at Marangai. There, he set up a farm mainly breeding cattle, and built a homestead. In 1862, hostilities broke out between Maori and the Crown in Taranaki, and by 1868 Wanganui’s settlers believed that an attack by Riwha Titokowaru (died 1888), the highly effective Maori warrior and leader who campaigned against Crown alienation of Maori land, was a real possibility. 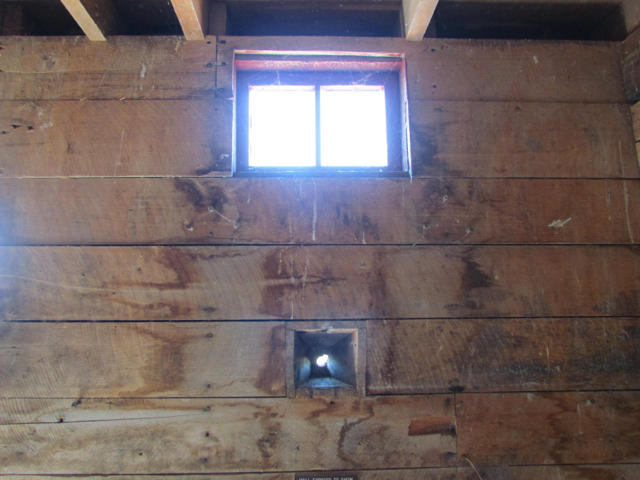 The Cameron blockhouse was built to provide a safe place for settlers and their families if they were under attack. Not only did it utilise a strategic position at the top of a steep hill with a sweeping view of the valley to the north, allowing the occupants to send and receive signals to people in two other blockhouses in the area, it also made use of available materials such as clay and sand to fill the “block” walls, to create bullet-proof walls. Fortunately, its design was never tested, as the blockhouse never came under attack. It was later used as barn for housing stock, and eventually restored by volunteers. Today it is a New Zealand Historic Places Trust registered site and can be visited by the public. For such a small, plain building, it really is spectacular, probably because it is on an amazing site. Because the surrounding area is still all farmland it almost takes you back 140 years. The sad thing is we’ve lost the ability to utilise natural materials like the early settlers and Maori did. Modern buildings are essentially made in factories and alienate us more from the natural world.